Powers/Abilities: Along with being an excellent organizer of criminal activities, Pink Pearl had an immense bulk and great strength. Pearl's bodyfat also gave her some degree of protection, as it cushioned her and she was able to survive being hit by a thrown knife. 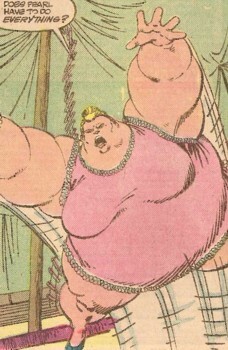 (Alpha Flight I#22 (fb) - BTS) - Pink Pearl's past history in unknown, but at some point she was hired by Clementine D'Arbanville while D'Arbanville's circus was still in Europe. Pearl came highly recommended by her previous employer...although Clementine had the distinct impression he was glad to get rid of her. (Alpha Flight I#22 (fb) - BTS) - Pearl was contacted by unknown parties who hired her for an assassination plot against the Prime Minister of Canada and the President of the United States -- both officials would be having a top-secret meeting in an ordinary farmhouse in Quebec, only three miles from the circus's location. (Alpha Flight I#22 (fb) - BTS) - All of Clementine's regular performers started having "accidents," and each time Pearl knew somebody who could take their place. At first counting her blessings, Clementine later realized she was surrounded by strangers -- all of them loyal to Pearl. (Alpha Flight I#22 (fb) - BTS) - Pearl was behind the delays that kept Clementine's circus out of season, long past the time they should have left Quebec and been off to their winter quarters -- all part of the assassination plot. (Alpha Flight I#22 (fb) - BTS) - Clementine contacted her old friend Jean-Paul Beaubier (Northstar). (Alpha Flight I#22) - Jean-Paul bought along his sister Jeanne-Marie (Aurora) to Clementine's circus, and the two were told by Clementine about her troubles and suspicions of Pink Pearl. Just then, the trio found themselves attacked and captured by Pearl and Bones. 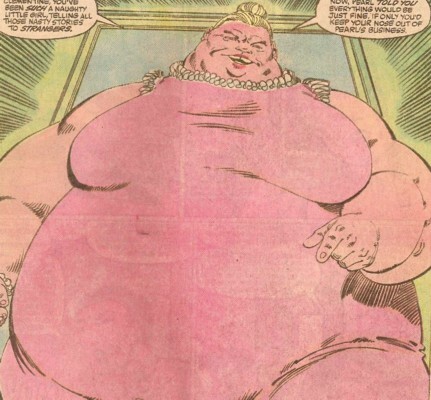 (Alpha Flight I#22) - As Pink Pearl held the three prisoners, she told them of the plot to assassinate the nearby Prime Minister and President by detonating a nuclear bomb in the main circus tent. Northstar and Aurora broke free, and in the ensuing struggle, Pearl was accidentally struck by a knife thrown by Bones -- all her fat cushioned her from a killing blow, but the sudden shock knocked Pearl out. Pink Pearl was subsequently taken into custody by the authorities. (Captain America I#387-388 - BTS, 389-391, 392 - BTS) - Pink Pearl was among the female super-villains assembled by Superia to form the Femizons. She watched a fight between Anaconda and Quicksand and later participated in the attack on Paladin and Captain America when they came aboard Superia's ship. She was also present during Superia's welcome speech on Femizonia and later went shopping. (Alpha Flight I#105 (fb) - BTS) - After being acquitted, Pink Pearl became a legitimate businesswoman and ran a club specializing in an all-male revue. (Alpha Flight I#105) - When Alpha Flight members Aurora, Guardian, and Diamond Lil (none in their hero costumes) went to Pink Pearl's club, Aurora disrupted business by jumping on stage and flirting with the strippers. Pink Pearl grabbed Aurora by the hair and ripped open her own dress, exposing the scars she'd born from their last fight. They traded blows before Pearl tossed Aurora aside, then Pearl leaped on Guardian and Lil, who punched Pearl through the window. The police arrived and arrested the three heroines. (Secret Avengers I#29) - Pink Pearl joined the Masters of Evil alongside hundreds of members in Bagalia. They attacked John Steele on behalf of Max Fury; Steele later died. (Secret Avengers I#32) - During the fight against the Secret Avengers Venom and Valkyrie Pink Pearl was touched by the virulent Carrion. The Abyss was vanquished and the Avengers let the villains go free, having no authority in Bagalia. (Secret Avengers II#2) - Pink Pearl was among the villains of Bagalia who battled the Secret Avengers, who sought to free Taskmaster. 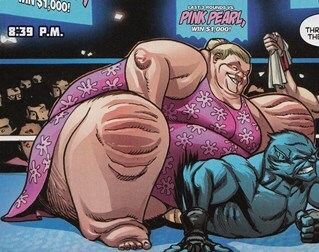 (A+X#12/1) - Beast was pinned down by Pink Pearl in a wrestling competition while his team-mate, Wonder Man, looked on. Presumably, Pearl is still running her nightclub. It may be that she did her wrestling ("Last 3 rounds vs. Pink Pearl, win $1,000!) in New York in the A+X story, given the proximity to Avengers Mansion in the A+X story. John Byrne got the name of this character from "Pink Pearl" art erasers -- thus the title of the first Alpha Flight story she appeared in, "Rub-Out". And a big THANK YOU to Chadman and Snood for assistance on this profile! One of Pink Pearl's sideshow performers, he was a combination "living skeleton"/contortionist/knife-thrower. 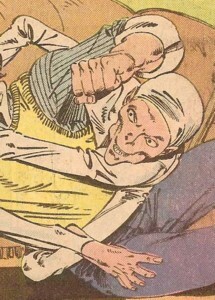 He acted as Pearl's right-hand man, and his favored method of attack was to ensnare people in his gangly limbs. Other unidentified agents of Pink Pearl, they included a bearded lady, a strong man, and a midget.